Description of "Microfinance Investment Funds: An analysis of profitability"
In the traditional financial system, profit and social solidarity have often represented a dichotomy hard to beat. In this scenario, the Microfinance Investment Vehicles (MIVs) are emerging as tools to build a bridge between private and social interests, increasingly in recent years, despite the fact that the world economy has been shaken by a strong global recession.After clarifying the often confused meaning of MIVs, Maria Cristina De Lorenzo utilises financial indicators like returns, Jensen's alpha, Sharpe Index, Treynor Index, Beta, R-Squared to analyse the performance and the risk of a sample of ten MIVs over the last three years. She compares the results obtained to three benchmarks representing the overall equity market (Morgan Stanley Capital International World Index), the socially responsible investment market (Dow Jones Sustainability World Index), and the emerging bond market (J.P. Morgan Emerging Market Bond Index Global). Her study demonstrates that, in general, MIVs outperformed the benchmarks. They can successfully improve portfolio diversification because there is no positive correlation with broader markets (Beta parameters are next to zero).Ultimately, De Lorenzo aims to provide ways of research defining standard indicators of social performance associated with such investments in order to reinforce the idea that ethically and socially responsible funds are both a great financial and social opportunity for all involved. Maria Cristina De Lorenzo studied Management Engineering at the University of Bologna and carried out her research project at the University of Sevilla, focussing on the performance of MIVs. 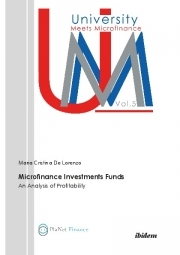 Reviews of "Microfinance Investment Funds: An analysis of profitability"